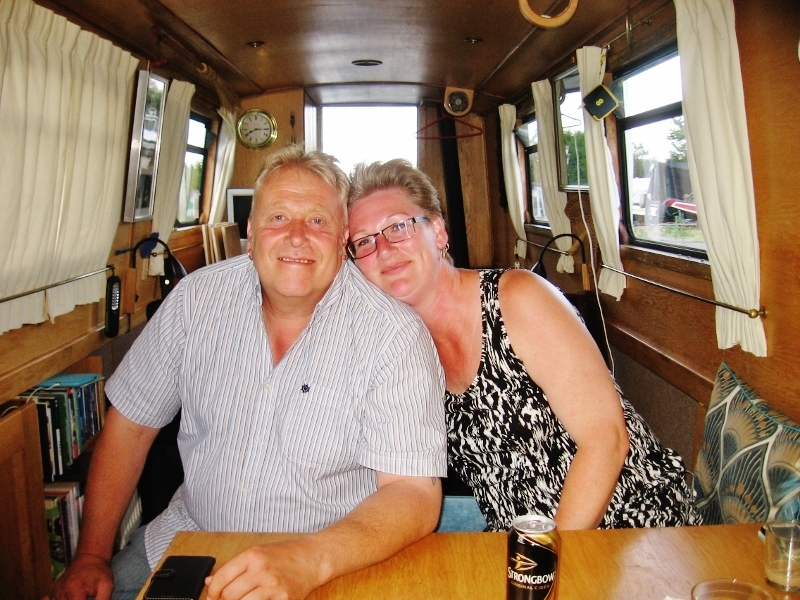 We've been steadily moving along with short periods of mooring up and chilling out--our life as it was pre-cancer. In Braunston several weeks back Les and I walked up to the local shop for a Saturday paper. On our way back to the boat we had the pleasure or running into Jim from NB Chertsey. He was out with the dog on a lovely sunny morning, while waiting for his wife Sarah to return from her work week in the city. Sarah writes one of my favorite boat blogs. Sorry we missed you Sarah, but we did enjoy our short chin-wag with Jim who looks no older than when we saw him last up on the Shroppie several years ago. I didn't have my camera so Bill remains semi-incognito for now. Andy and Tina of NB Ytene. Just looking at this picture makes me smile! 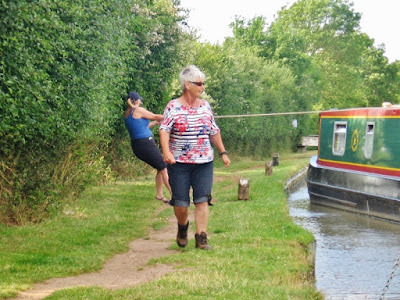 Whenever we are anywhere near Braunston, we always take a turn through the double bridges and head south for Napton to meet up withfriends Andy and Tina on NB Ytene. We had a lovely handful of days in the area walking to the local windmill, which will feature in a longer post to come, and visiting with the Elfords. Dinner, drinks and hours of hysterical laughter ensue every time we get together as we introduce them to yet another new game (the British Railroad Game this time, thanks to our friends Ken and Sue Deveson of NB Cleddau who introduced it to us). No one tells a story like Andy and Tina--no one. I nearly lost control of my bladder several times and laughed so hard tears poured from my eyes. Thanks mates, for bringing us the joy of your company. 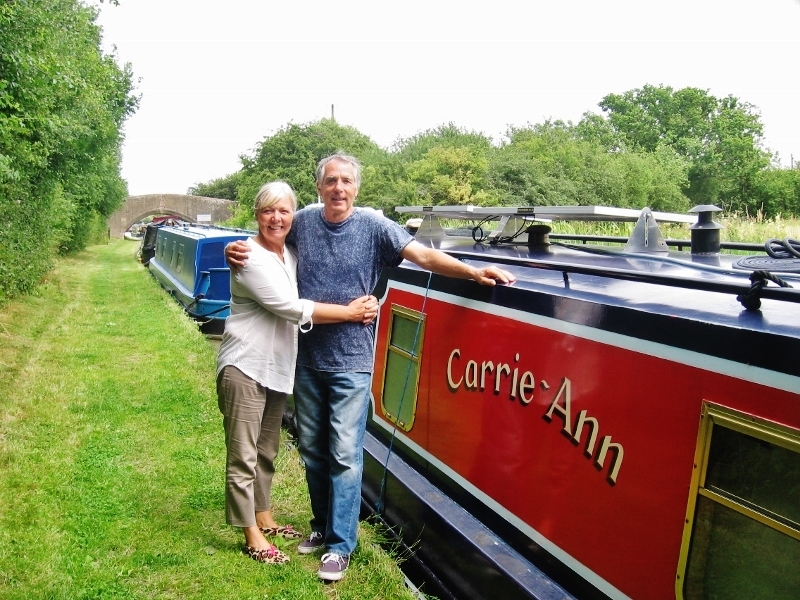 Sue and Colin next to their boat NB Carrie-Ann. Winnie the boat bunny is napping inside. As we cruised past Napton Narrowboats and under the Tomlow Road Bridge, I spotted a familiar red and blue boat we had not see in almost a year. Moored up by the bridge were Susan and Colin of NB Carrie-Ann. We first met them in June 2014 at Cassiobury Park and we really hit it off. They are also live aboard continuous cruisers who choose to live a low tech lifestyle and don't blog but they do travel with a whimsical pet--Winston the boat rabbit! He's large, grey, and soft as thistle down. We called out to the boat and up popped Colin with Sue behind him. We breasted up, sat on their stern deck with cups of tea and enjoyed a lovely warm summer afternoon catching up. We hope to cross paths with them again soon. Marilyn of NB Waka Huia and her trusty old hiking boots. Les and I continued on toward the Napton lock flight, turning at the winding hole before the top lock, to settle in for a day or so of boat restoration work (scraping, filling, sanding, etc.). The late afternoon heat was getting the better of us so Les and I decided to have a mosey down the lock flight--but first we stopped at the local lock shop for two ice creams. We sat in the shade eating our naughty snacks and then we walked back up to the towpath. A woman and a young boy had come across the top of the lock and were walking ahead of us. Les said, "Jaq I think that's Marilyn (NB Waka Huia). I'm sure that's her hair (short, spiky and silver.) I told Les it couldn't possibly be Marilyn as she and David had gone up the Calcutt lock flight towards Warwick only days prior. My far sight is not good, and Les was not sure so we continued to follow behind. As the short, silver haired woman slowed to allow her young companion to keep pace, I notice her boots--sturdy, well worn hiking boots and it was then I knew Les was correct--it was our Kiwi mate Marilyn! We called out, she turned and walked back to offer big hugs and an introduction to her grandson Olek who was visiting from Scotland. We spent several pleasant hours sitting alongside the towpath drinking wine and eating nibbles while catching up. Les and I were mightily impressed with young Olek who is thoughtful, smart, and helpful. He also has excellent manners and can hold his own in a conversation with old farts like us. He reminded me of my grandsons Micheal and Matthew back in the States. 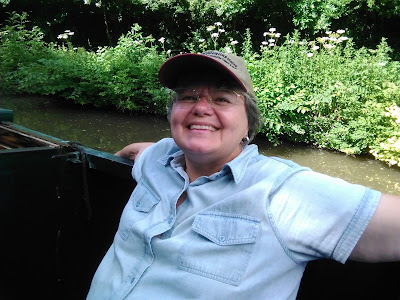 After all this jollity and frivolity we cruised back to Braunston where Les filled the boat with water and dumped the rubbish while I walked up the high street for a Saturday paper, checked on our Post Restante mail which has still not arrived after a month, and we turned and cruised...North! As soon as we passed the second service point at Braunston, just north of the two white bridges I let out a whoop and hugged Les tight. "That's it baby. We haven't cruised this far north in two and half years!" 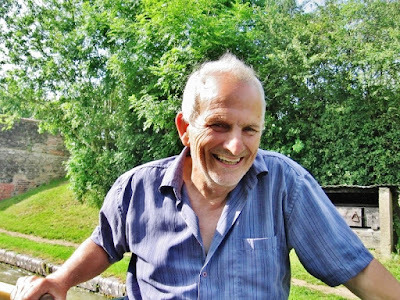 We had in fact been moored up at Braunston on New Years Eve 2012 when Les experienced the first bout of bowel trouble that signaled our decent into his cancer journey. For the first time in two and half years Les' eyes sparkled and shined with life and his laughter echoed across the cut. He pulled me close and we kissed as we cruised--gratitude deep in our hearts for making it thus far. We enjoyed the slightly windy afternoon, with sun coming and going behind fast moving clouds. We ate tuna sandwiches on fresh baked bread and drunk hot cups of herbal tea from the back of the boat as we carried on. Rain was forecast for later in the evening and all the next day, so boats were passing us at a fast pace attempting to make time before the rain began. We stopped at Hillmorton Chandlers to pick up some Owatrol and say hello to Richard--the shop owner and the only U.K. distributor of Airhead Marine Composting toilets. Richard was out so we missed saying hello. 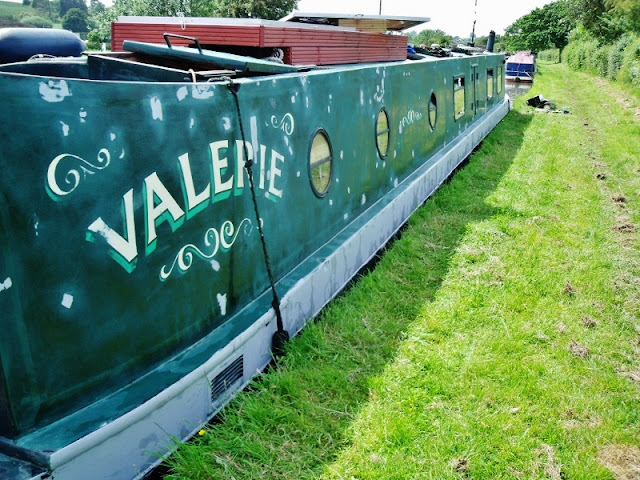 NB Valerie was moored adjacent to some outdoor tables by the pub next to the chandlers. As we walked back to our boat, a man in a blue T-shirt approached and said, "You're Jaq and Les aren't you? " and he held out his hand. I was caught by surprise. I shook his hand as he introduced himself: "I'm Tony and this is my wife Julie." Well knock me over with a feather! 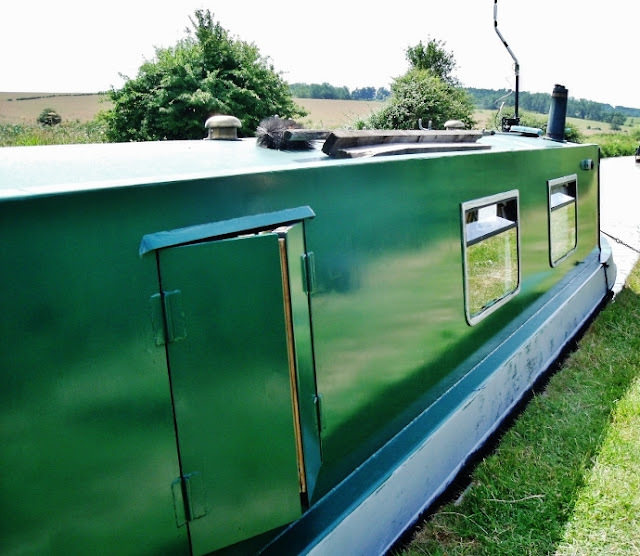 Tony and Julie have been corresponding with me for months about their new boat build and their desire to have an Airhead composting loo on board! They had traveled down to meet Richard and look at toilets only to find him out. We chatted about boaty things and then they said good bye and we were off again. 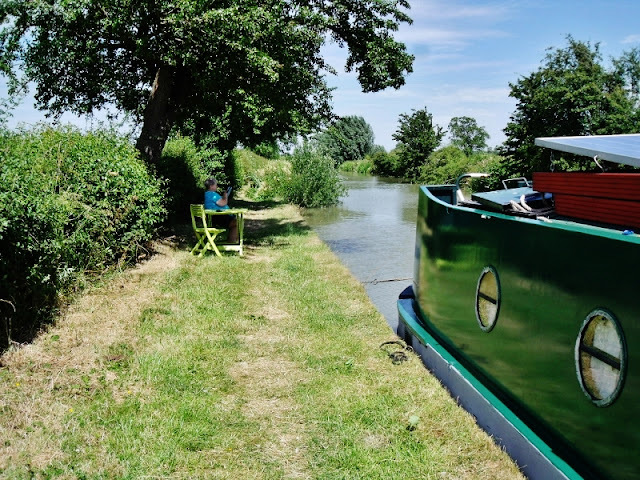 It was wonderful to meet you both in person and we hope to cross paths on the cut when you are aboard your lovely new boat NB ChasBella. Thanks very much indeed for stopping to say hello. New friends are often people you haven't met yet. We are moored up again in a quiet stretch of canal as rain beats a rhythm on the roof. A pot of fresh chicken noodle soup simmers on the stove and fresh baked bread waits on the counter for dinner. A container of homemade coconut yogurt will be finished and ready to make into parfaits with granola and fresh strawberries by 11 p.m.--just right for us night owls. The view from our mooring between Braunston and Napton. Plenty of places to be away from others and get the generator out and sand the boat. Not to much work as the sun does tend to slow things down. "Mad dogs and Englishmen go out in the midday sun". Well not this Englishman or his U.S. wife. Instead we chill out with board games or cards at our table in the shade beneath a tree sipping chilled home made lemonade and admire the view. Jaq was sitting at the table one day cleaning her jewellery and I spotted this amongst it all. It will be recognised by U.S. readers as a hospital wrist band. This one was around Jaq`s wrist as a new born baby in the late..... now what`s 35 off 2015, oh yeah it was the late 1970`s. You can laugh but after 67 years I know how to keep a lady sweet. Nowadays in the U.K. we have bar coded wristbands appearing but I can find no trace of the style from say 40 plus years ago. I would guess they were hand written on a paper like strip. If someone here in the U.K. has one tucked away, send me a pic and I will share it. Look at the way the cord of Jaq`s is joined, that is Lead. Pink beads for the girls of course. Of course E Bay has a few selling for around $10. Nothing is sacred as far as the flea pit is concerned. Above is a comment, one of hundreds, that end up in the spam box. Now usually they have a url attached or simply have the words check my site party hats for you or whatever. Now as you can see in this cut and paste no such references are made. This one attached itself recently to a post of a year ago. Can anyone tell me what these comments are all about? Is it just someone who likes to fill peoples blogs with garbage something like the idiots that send viruses around not having any idea who it affects but get some kick out of causing mayhem. Beats me, just glad the spam filter picks them up. The view from the bottom lock. Hire fleet base on the left and boat builders on the right. The rally was held over the weekend of 27/28 June. Mooring restrictions were in force a week before. This is fair enough as many of these old working boats come from all over the system and some owners might still be working and need time to get boats there. 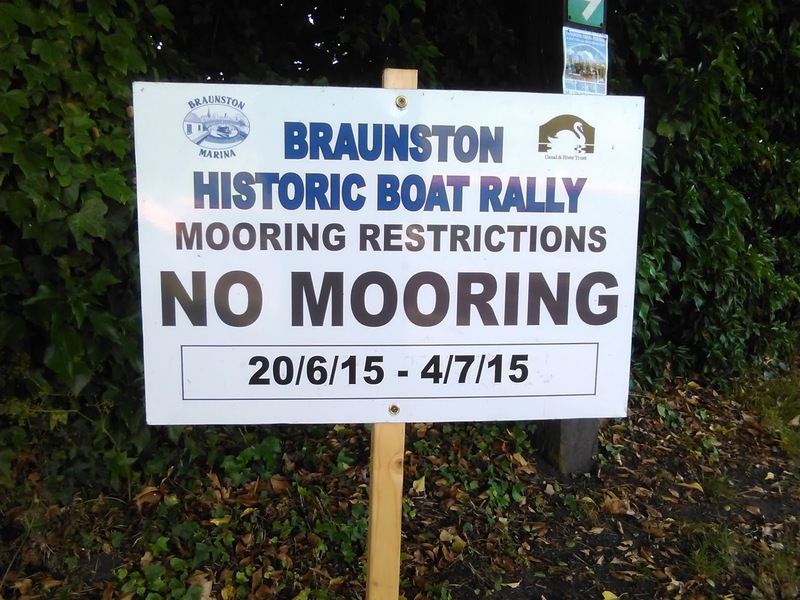 Fair enough the show is advertised and the restriction will be common knowledge and some boaters might avoid Braunston during this period as mooring will be restricted. We came through the tunnel and started down the locks on the Thursday evening after the weekend of the show thinking some boats would have left freeing up space. We met a boat coming the other way who remarked there were a couple of spaces but the notices banned mooring till the 4th a week after the show. As boats left surely any passing boat could moor in the space. 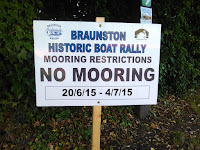 The show was over so why do you need mooring restrictions. The volunteer in the stop house bless her said it was because some of the show boats liked to stay on for a few days. When I mentioned in that case there would be no space to moor she took a while thinking then had to agree but still had no explanation as to why the empty spaces are not to be used till the 4th. 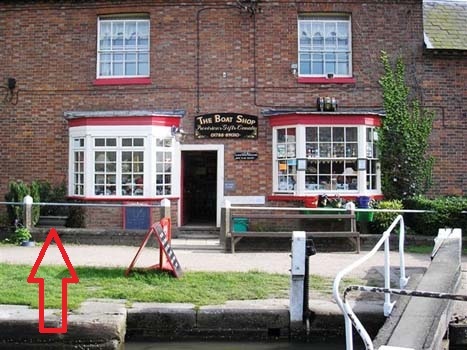 This is the shop at the bottom lock on the Braunston flight. 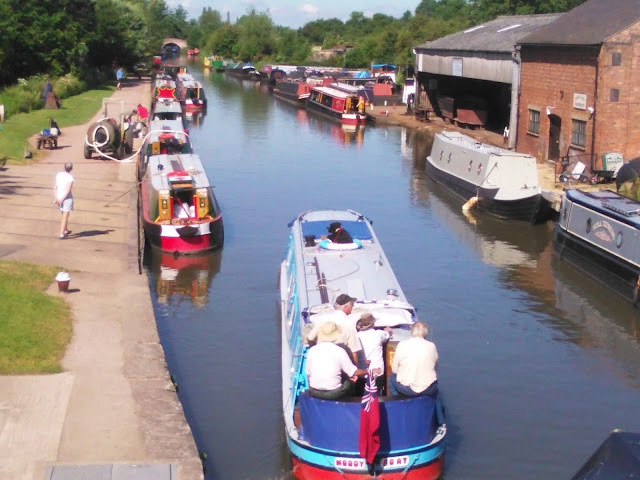 It`s a very busy place being next to the lock in a very busy area. people are walking past this shop continually during the day. In the picture I have highlighted the plant pot pictured left. This believe it or not is where a Duck decided to hatch out her ducklings. The egg shells can be seen but out of sight one egg remains un-hatched. 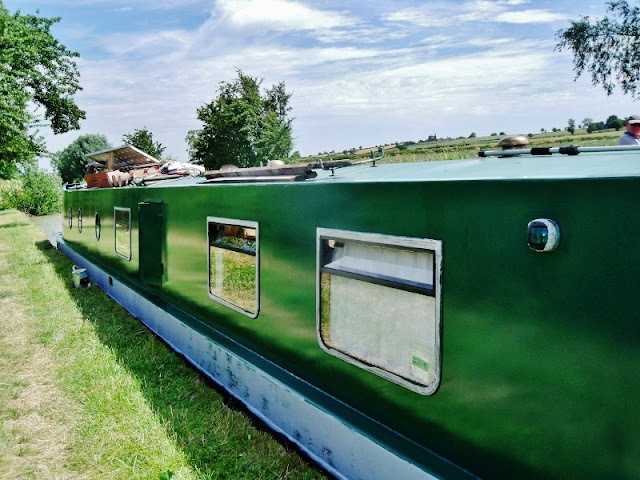 While many people who don't live on a boat think this life is one of endless idyllic, halcyon days, we can assure you that like all else in life, boats require maintenance, and unless you are independently wealthy or even moderately well off, life aboard a narrow boat will require you personally to engage in regular boaty chores. The engine oil needs changing every 300 hours, the batteries need looking after, the shower pump filter will clog up about every three months, requiring one to uncover it from wherever it lies buried; behind panels underneath the bathtub perhaps, like ours. I can always tell when the pump filter needs cleaning because the tub won't drain properly after a shower and begins to sound like a sick opera singer with a bass voice register and a really bad sore throat. Les takes it all apart and scrubs the filter with one of my old toothbrushes, puts it all back together and we are good to go again for another quarter of the year. We use cocoa shell mulch for the dry mix in our Airhead composting toilet so it really does need to be dry, Sadly, garden centers don't understand that if a bag of plant material--which is what cocoa shell actually is---is left stacked outside in all weathers, it will inevitably get wet, and the composting process will begin in the plastic bag it comes in. You can tell your cocoa shell has been wet if, when you open the bag, you see chocolate colored shells mixed with gray, papery shells which resemble the paper in a wasp's nest. Cocoa shell should be a deep, rich brown color and smell like chocolate. If you use this product in your composting loo and your bag has gotten wet, it is imperative to dry it out so it will work properly in your loo, and so it cannot provide a haven for bugs that like damp, dark places to live. 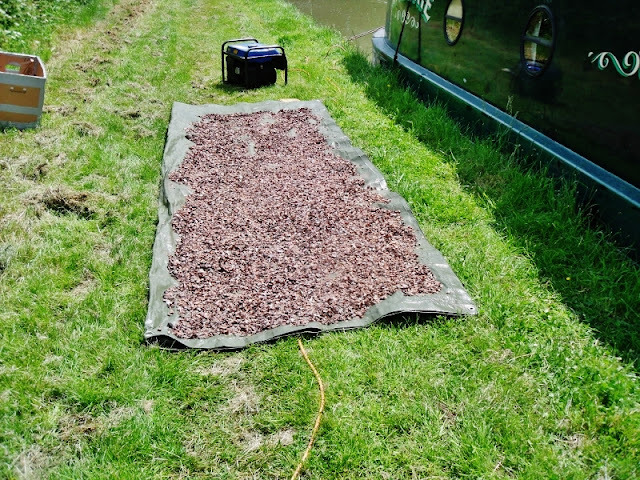 Drying a bag of cocoa shell mulch in the sun. I was emptying and cleaning our Airhead toilet last week, as it seemed entirely too wet, and was not composting properly. We also had a massive infestation of red spider mites. Now these plant bugs like wet, darkness, and moist heat--and our solids pan seemed to be their favorite place. The extreme hot weather gave them the impetus to attempt a take over of our bathroom so it was war! I tried drowning them all in boiling hot water with bleach to no avail. 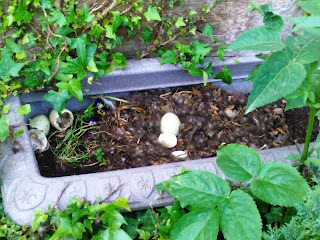 We thought they had arrived in a bag of wet cocoa shells some time back. Anyway, after thoroughly cleaning, disinfecting and putting the toilet back together, I realized our toilet fan had not been extracting the moisture from our toilet properly. 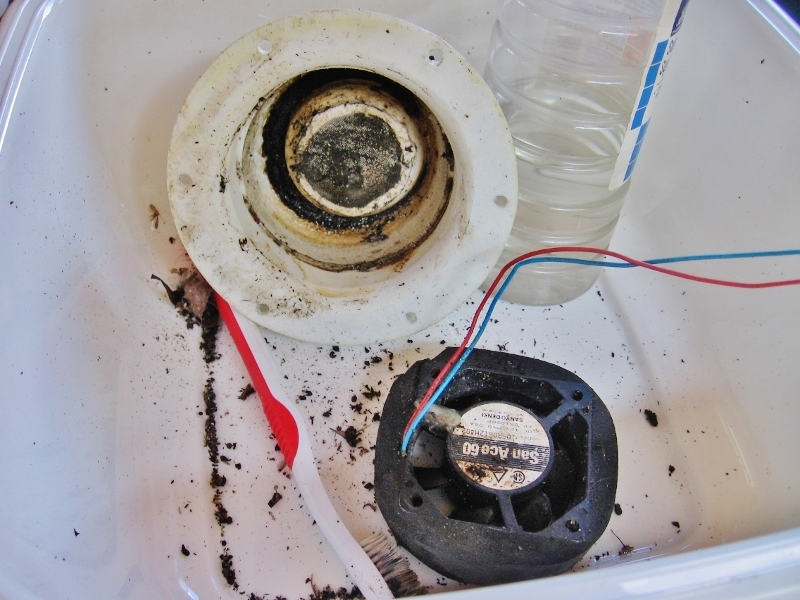 Condensation was collecting in the hose pipe which vented the toilet via the fan through the roof to the outside. I called Les to take a look and he figured something was blocking the fan, so off came the hose, and he unscrewed the fan housing from the roof to exclaim, "Look Jaq!! Spider mites! Millions of them! Sure enough they had made a happy home amongst the fan and in the housing, clogging it with friss (bug poop), and debris. So Les climbed on the roof and removed the mushroom vent--to find the inside caked with dirt and muck, as was the hole in the boat roof where the fan housing had been. 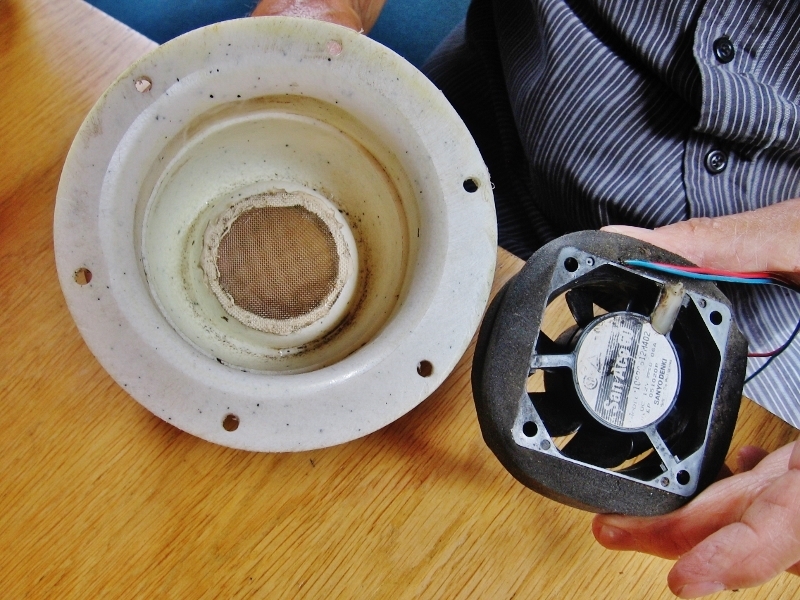 The fan and its housing which connects to the ceiling in the bathroom. Nasty!! Now that's better! Clean, dry and ready to put back together. 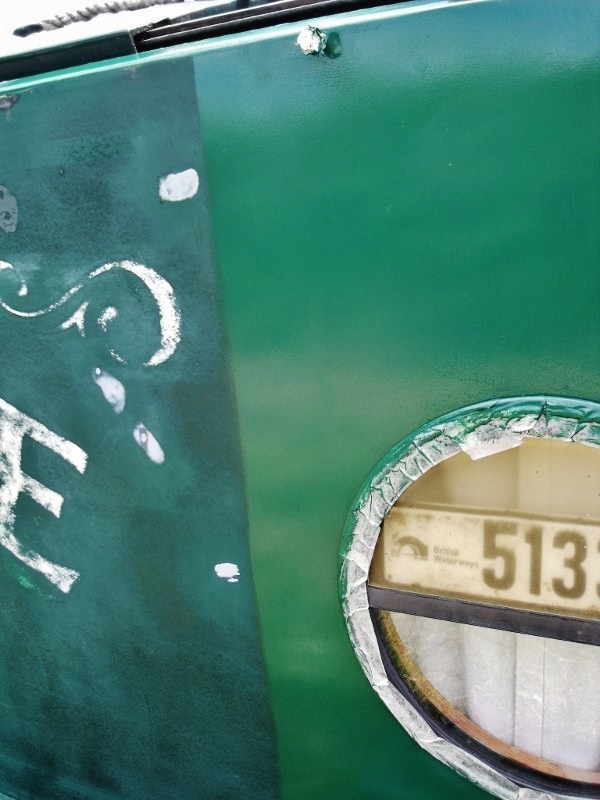 ...painting the boat. After making countless passes on each side over the last four weeks, painting rust converter into all the bald, exposed metal which has begun to rust as our original thin spray-on paint job has faded and flaked, sanding it all, painting and filling all the spots and sanding again, we finally felt ready to begin painting. The black stuff is rust converter which is supposed to seal the exposed metal and convert any rust to an inert layer no longer eating at the boat. 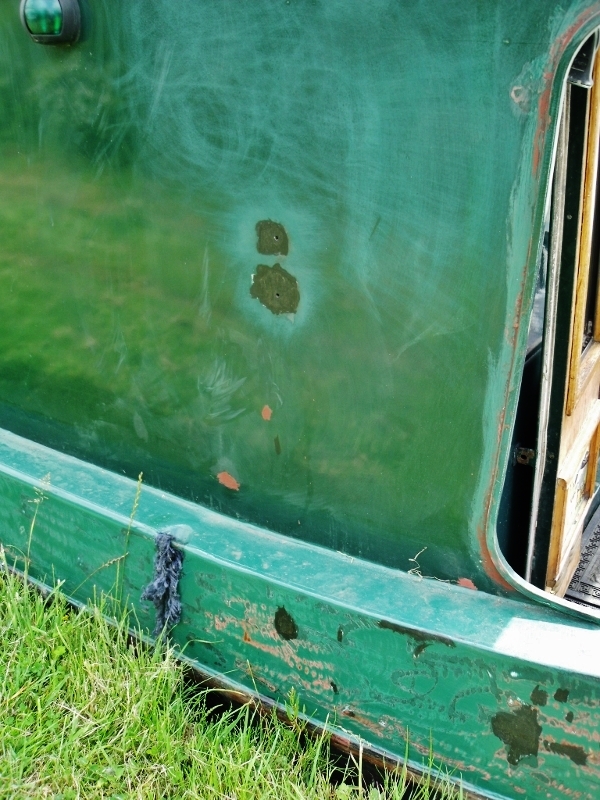 Poor NB Val was pitted with rust spots and looked really tatty. These boats have many lips, edges, nooks, and crannies; you have to get into all of them to stop the rust and re-paint the boat. 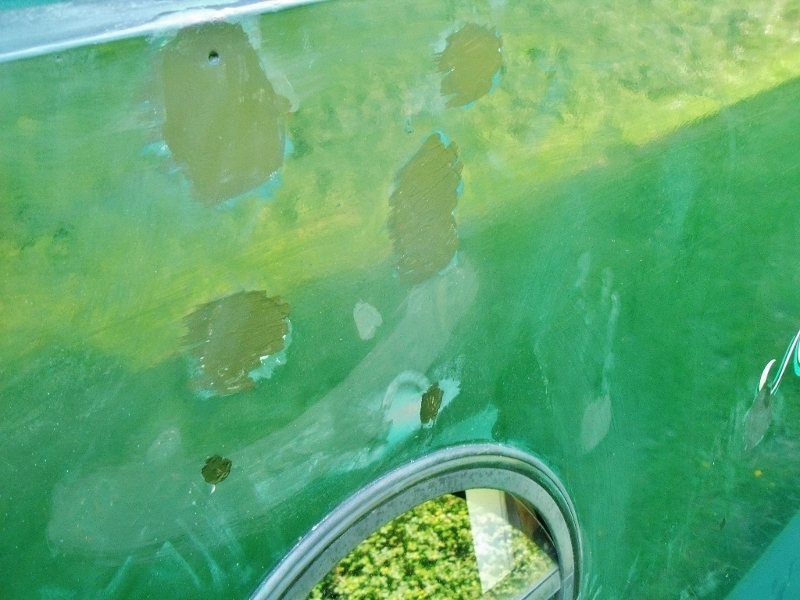 ...hunting down every spot of rust, every bit of exposed metal and every flake of loose paint. NBV looked like she had a bad case of the measles! A good close up of before and after in one shot. This morning we rose early while the sun was still shining on the port side and we painted one coat on the starboard side. While we are not professionals, and we cannot achieve perfection, we felt chuffed by the outcome. This first coat was our "learning experience." We know now that we must be up at sunrise to finish painting the boat before the metal, the air, and the paint all grow too hot and too thick. 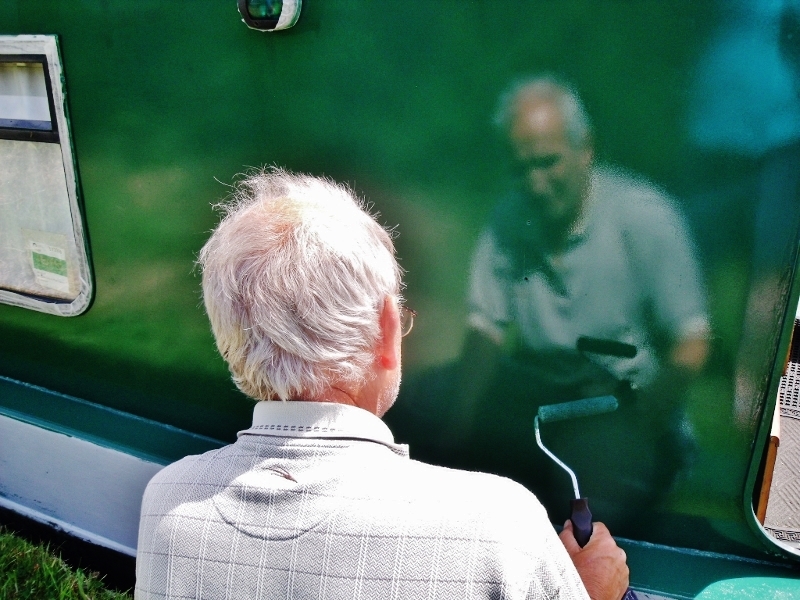 We used a good, short napped roller and Les painted sections as I followed him laying it off using a brush. We thought it looked pretty good until we went to lightly sand it this afternoon. The brush left marks in the paint, so we have decided not to lay it off with a brush. That technique is for professionals--or those with better fine motor skills than the two of us! We will just roll it on evenly and let it dry. We also know now that we will be doing a minimum of three coats not two. "Look Jaq--I can see myself in the paint!!! ...and the rear half of the starboard side. Looking good! Our table in the shade of an apple tree where we take our meals and wait for paint to dry! NB Valerie looks much prettier and fresher in a new coat of paint and updated color. 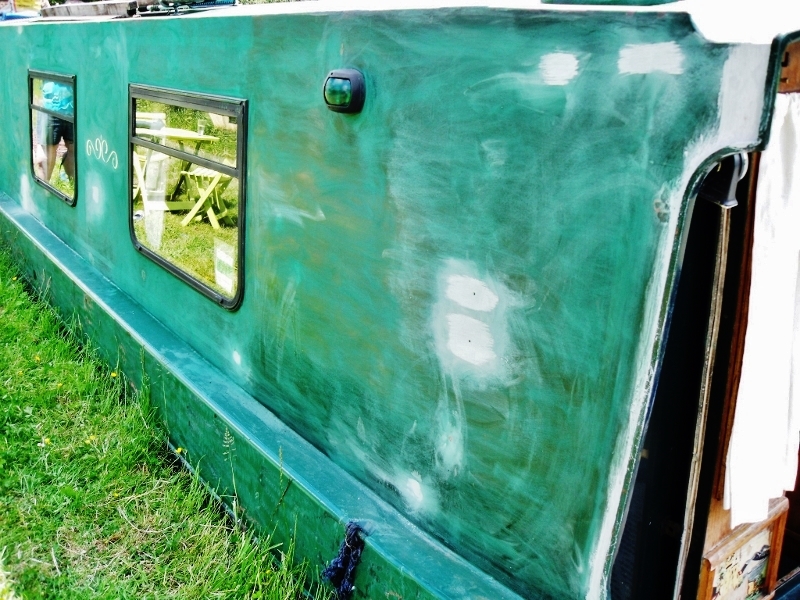 Once the coach writing is done we think the boat will look quite smart indeed. Now if we can just get the Eberspacher (diesel and electric water heater) to work properly, life will be darned near perfect!! I know we all get junk mail but recently I had a look through mine instead of deleting it en mass and it seems that there are a high amount of deaths amongst rich people in Africa. My friend, well he says he is, George Kiby has $17.5Million belonging to a family who are dead. I can quote eight others with higher amounts but all the people have died. Plane crashes are common so make a note if you visit Africa hire a car, no internal flights. My junk box at the moment has requests to help move $72 million. To be fair there was Thelma who had not dollars but sterling and it was here in the UK rather than the bank at Burkina Faso like some of the others. Sadly Thelma`s exclusivity ends there because she sadly is dying. Death and money seem to walk hand in hand through my junk mail box. The International Monetary Fund (Africa branch) owes me $10m. but I refused it. I am busy fighting my own battle with death and winning so no point importing it amongst some dollar bills. Now all these shysters trying to get into peoples hearts and bank accounts are bad enough but the one I reproduce below takes the biscuit for bad taste (my opinion). I am far from being a religious person but can imagine a vulnerable person with just their faith to cling to might be taken in and lose what savings they have. Some of these scam letters quote passages from the bible and ask you to read them. Princess Grace Tina Yak has $5.1M to shift and by coincidence her husband died in a plane crash and the money is in the bank at Burkina Faso. It appears a plane load of millionaires who all banked in Burkina Faso were on the same plane and it crashed, how unlucky is that. I greet you with the name in the name of the LORD Almighty the giver of every good thing. Good day and compliments of the seasons, I know it is true that this letter may come to you as a surprise. Nevertheless, I humbly ask you to give me your attention and hear me well, but I implore you to take the time to go through it carefully as the decision you make will go off a long way to determine my future and continued existence. I am Mrs Heidi Hadizan Mariam aging widow of 57 years old suffering from long time illness. I have some funds I inherited from my late husband, the sum of (9.5 Million Dollars) and I needed a very honest and God fearing who can withdraw this money then use the funds for Charity works. I WISH TO GIVE THIS FUNDS TO YOU FOR CHARITY WORKS. I found your email address from the internet after honest prayers to the LORD to bring me a helper and i decided to contact you if you may be willing and interested to handle these trust funds in good faith before anything happens to me. Having known my condition I decided to donate this money to Churches, organizations or good person that will utilize this money the way I am going to instruct herein. I want you to use this money for Churches, Charity organizations, orphanages, widows and other people that are in need. l took this decision because I don't have any child that will inherit this money . Moreover, my husband relatives are not close to me since I develop a Cancer problem and it had been their wish to see me dead in order to inherit his wealth since we have no Child. These people are not worthy of this inheritance. This is why I am taking this decision. I want your urgent reply to me so that I will give you the deposit receipt which the COMPANY issued to me as next of kin for immediate transfer of the money to your account in your country, to start the good work of God, I am desperately in keen need of assistance and I have summoned up courage to contact you for this task, you must not fail me and the millions of the poor people in our todays WORLD. This is no stolen money and there are no dangers involved,100% RISK FREE with full legal proof. Please if you would be able to use the funds for the Charity works kindly let me know immediately.I will appreciate your utmost confidentiality and trust in this matter to accomplish my heart desire, as I don't want anything that will jeopardize my last wish. I want you to take 40 percent of the total money for your personal use while 60% of the money will go to charity.I will appreciate your utmost confidentiality and trust in this matter to accomplish my heart desire, as I don't want anything that will jeopardize my last wish. Any delay in your reply may give me room to look for another good person for this same purpose. Please assure me that you will act accordingly as I stated herein. I don't need any telephone communication in this regard because of my ill-health. Back to the nicer things in the junk mail box. Those nice people at Paypal have told me three times my account has been compromised. These e mails have come from three different depts. judging by the different sending addresses. That is customer service and nice to know someone is looking out for me. I just had to sign in and it would all be sorted out. I feel upset after all the trouble they went to but it seems I don`t have a Paypal account. All is not lost, the Inland Revenue owe me £203.37 and I need only fill in a form with my bank and card details including the security code, I guess they ask for that with all the crooks about, and the money will come into my bank. They even attached the form how good a service is that. Amazon say my account has been updated and they want me to sign in and ........update my account. Two wrongs don`t make a right but what do two updates make. Probably a fool. I recently had a spam comment on the blog that gives a clear picture of what to do with your junk mail. You will find the translation on the very last line. Not all e mails are junk because they begin with unusual words like "dearest one" or "loved one". I had one from a lovely lady that began "Dear Sir" and the rest they say is history. No forms to fill in or bank details wanted, just some information on single handed boating. Best import this country has seen in decades. The recent fiasco of the post office receiving our Poste Restante parcels did have a bright side. This view is the first part of our walk to the post office. 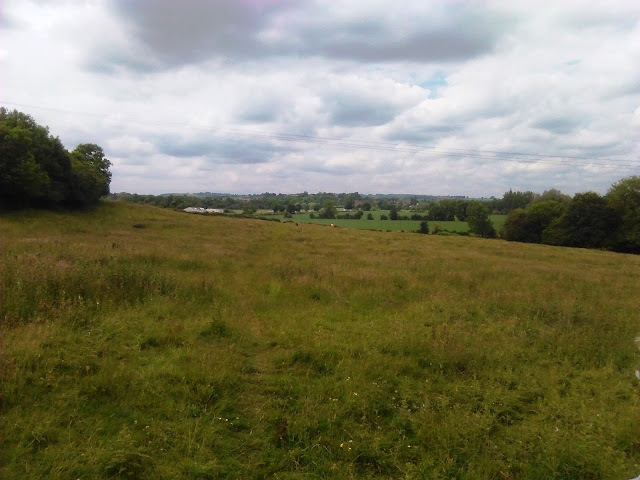 We left the towpath via a stile and followed the path across this field. Another stile and we entered this crop of field beans. As you can see the farmer has left a path through the plants as it is a public right of way and cannot be blocked. U.S. readers this is what I missed in your country, the ability to follow paths across farmland. 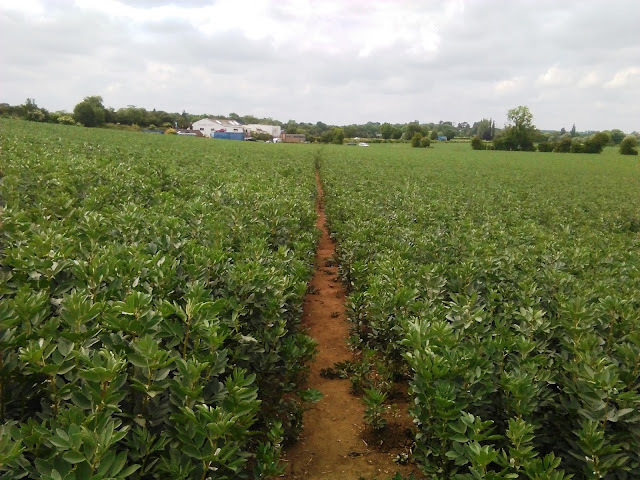 Field beans are worth about £70-90($105-1350 per tonne so i`m wondering how much the farmer has lost having left that path clear. The field finished at a main road but crossing brought us into a quiet lane passing under the canal past the church and into the village. Jaq and I have a joke between us that I never if at all possible walk back the same way. This time it was no different and we walked a few hundred yards from the post office to the canal towpath. 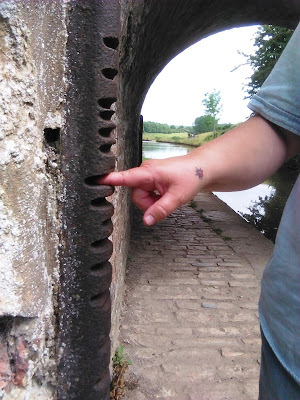 My model has her finger in the grooves worn by ropes of horse drawn boats back in the days of heavy commercial use of the canals. It`s hard to imagine rope wearing down the iron guards but I guess it caused less damage to the rope than if the brickwork took the wear. Just another quiet day in our life afloat. I said to Jaq remember when we had to use the car to go to the post office stateside or walk 7 miles along roads all the way. One of the parcels contained my new solar controller. It`s 30 amp Tracer 3215 capable of handling 390watts of solar panels. With just my 230watt panel connected it is giving 10 amps on a not very nice afternoon. Not wanting to sit in front of it all day I guess it will in good sun go up to 13amps, I stand to be corrected.